How to add Testimonials to your page/post? To add testimonials to your page/post simply click “Testimonials” shortcode button, that can be found integrated in default editor panel in visual mode like in the image. Testimonials settings comes with simple text field, where you can set the interval between the further testimonials and dropdown menus, where you can select categories and effects of shown ones. “Testimonial Category:” dropdown menu allows you to set the category separately or select all categories that will be shown further. “Number of second to show:” field allows you to set the interval between the upcoming testimonials. 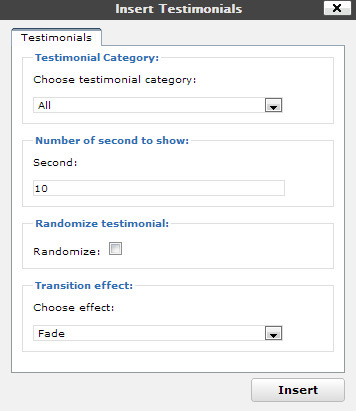 “Randomize testimonial:” checkbox allows you to select the order of displayed testimonials. “Transition effect:” dropdown menu allows you to select the effect of displayed testimonials.